On August 29, 1793 the French commissioner Léger-Félicité Sonthonax issued a decree freeing the slaves of the Northern province of Saint-Domingue, followed two weeks later by a similar decree by his fellow-commissioner Polverel for the rest of the colony. This historic decree infuriated the whites of the colony, as well as some of the mixed-blood population and in order to defend himself, Sonthonax had the following printed as a broadside that was posted throughout the island. 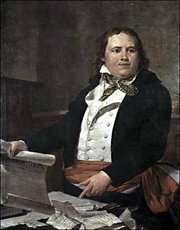 I have just learned that the cowardly and imbecilic Lasalle, after having kneeled before the English in order to be granted permission to emigrate, has finally obtained his grace at the price of a diatribe in the form of a proclamation against the civil commission, printed by the royal press of Mole. That that proclamation, where I am dismissed by an officer I created and that the law put under my orders, is being widely broadcast throughout the North. I learn that in almost all of the communes still intact in that province, notably at Gros-Morne, that farmers are forced to submit to the whip; that my proclamation isn’t being carried out; and that in those places where Africans know of it they are ceaselessly told that I don’t have the right to free them. At the same time I learn that other more subtle villains, basing themselves on a proclamation of my colleague Polverel, say that I wasn’t free in Le Cap when I pronounced the general freedom of the slaves of the North, and that I am busy with another proclamation retracting that of August 29. I have also learned that newspapers from Jamaica are being circulated in the colony, as well as personal letters from Mole announcing to the good people that they have no longer to obey the civil commissioners, that they were recalled and accused by the national Convention, and that Englishmen who were the white cockade and the Cross of St. Louis found themselves the executors of the legislative body. I declare that the letter was signed by him and offer to all those who would like to assure themselves of this fact that they come to the secretariat of the civil commission to recognize his signature. I declare that I was perfectly free during the entire time of my residence in Le Cap; that I especially enjoyed the most complete freedom when I proclaimed the Rights of Man in the Northern province; that the Africans and descendants of African awaited my decision with the most touching resignation and that they would have respected the person of the delegate of the republic even if I would have refused to fulfill their wish. I declare that I will support until death the civil rights and the independence of those with mixed blood, of Africans and the descendants of Africans, and that if I were to be pounded into mortar I would never be so low as to retract the proclamation of August 29. I declare that it is false and absolutely false that my colleague Polverel stopping the progress of liberty in the West and the South. I declare that the liberty bonnet was openly displayed in all the public places of the cities of the West and South, and that the majority of Africans and descendants of Africans were there declared free. At the same time, I declare that my colleague and I are working on a projected law, applicable to the three provinces that will, in a stable manner, assure the interests of the colonists and the absolute freedom of the slaves. We order that the above declaration and Lasalle’s letter be printed, published, posted and registered in the intermediary commission as well as the municipalities and tribunals of the provinces of the north and west, and sent to the municipalities of the South. Accept my compliments for the wisdom of your proclamation of the 29th, a few copies of which you sent me. It was impossible in so critical a moment to reconcile the good of farming with the rights of humanity, and a third of the production accorded as their share to the members of the work gangs forces the farm workers to defeat their laziness and to do right by the owner, since their salaries increase with the harvest. I believe that the owners of the owners in the other provinces, if they carefully reflect on the advantages that will result for them from this wise measure, will be the first to accept it and demand its execution in their respective quarters. Decree abolishing slavery in the North of Saint-Domingue (1793) - Original Haitian Creole text of the document by Sonthonax. Toussaint dialogue with Léger Félicité Sonthonax (1797) - Toussaint report of a contentious meeting with Sonthonax, before he had the commissioner expelled. Coopération interuniveritaire Haïti-Grenoble-Chambéry: Proclamation de Sonthonax du 29 Août 1793 - French text of the proclamation abolishing slavery. This page was last modified on 22 April 2008, at 06:50.